Is Everything available for free on the Internet? T. Scott: Can You Have It Both Ways? oadl - Wiki Now has a rough structure of the "GUIDE TO DEVELOP OPENLY ACCESSIBLE DIGITAL LIBRARIES". Any suggestions? EBM Librarian is a wiki is to develop a community of librarians who are involved in teaching and supporting the practice of evidence based medicine (ebm) or evidence based practice (ebp). "I am back from an International Conference on Digital Libraries, 5-8 Dec. 2006. 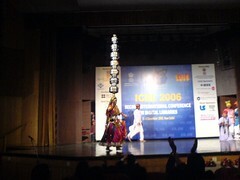 It was organised by TERI at New Delhi (ICDL 2006). well as educators, researchers and policy makers. A first step, I can think of is forming a discussion group. I know there are other groups as well — but these are mostly oriented towards LIS professionals. We never know what our target users feel about issues that may dear to us. So a Group called "Open Access and Digital Libraries" has been created. If you are interested in Open Access, you are welcomed to join it. The forum aims to promote and adopt Open Access principles for developing Digital Libraries which can be accessed by anyone. No intranets and no Login / Passwords — Simply Open Accessible." You can set up your own collaborative blogging site. How to manage this Knowledge?